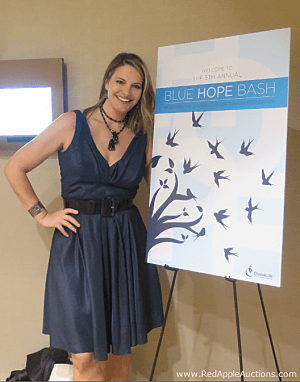 Fundraising auctioneer Sherry Truhlar at the Blue Hope Bash, a gala auction that used silent auction mobile bidding. Watch the video to see nice displays and other elements. In this first clip, you’ll see an auction layout of an event I worked two weeks ago here in Washington, D.C. The organization, Chris4Life Colon Cancer Foundation, is only five years old. Yet the group has already raised a whopping $7 million dollars to fight colon cancer. (Impressive!) They have three core initiatives focused on research, awareness, and patient care. This is the second year they’ve had an auction at their gala, and it was the first year I worked with them. The gala was held at the lovely Four Seasons. The hotel has great staff, but for a silent auction, it’s a bit of a tricky layout. You’ll see why in this video. The organization used a mobile bidding vendor so you won’t see silent auction bid sheets in the silent auction area. And here’s a second video, also using mobile bidding. This was “A Night in Paris,” organized by 360 Youth Services in Naperville, IL. It was about twice the size as the event above and had all the activities — silent auction, dinner, and live auction — in the same room. What has been the success of other auctions with mobile bidding? Our auction, which is in its 34th year, has over 500 guests (of all ages) with a silent auction of 400 items and a live auction. We have had mobile bidding the last two years of up to 50 items… my young volunteers would like to have mobile bidding for all 400 items. Any experience? Gosh Kathy, that’s a really broad question. As with most things, some groups love it. Others abandoned it after 2-3 years. But in your case, it would seem to me that it would be easy for you to make a decision. You’ve been running what statisticians would call a “split test.” Simply do an analysis on those 50 items compared to the 400. If sales on those items are performing better than the others, roll it out.